Ministry of Propaganda - 21/Aug/2006: "2.5 Munros, 1 Island and 3.5 Books Later"
Almost exactly a year ago I wrote 4 Munros, 1 Island and 1,900 Miles Later, this year the numbers are a bit lower (and I don't know how many miles I drove, but probably less). In other words, I'm back from my holiday. It had all started very well: After driving to Lancaster on the Friday evening I continued towards Aviemore on a nice and mostly sunny Saturday, stopping in Dunkeld for a nice walk along the River Tay. The Sunday turned out very nice despite a grey and drizzly morning, allowing me to walk to the summit of Britain's second highest mountain, Ben Macdui in the Cairngorms (1,309m/ 4,294ft). 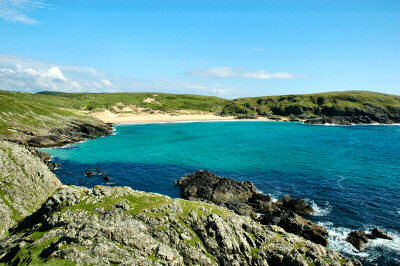 Very nice views and probably quite a few nice panoramas to come from this walk! 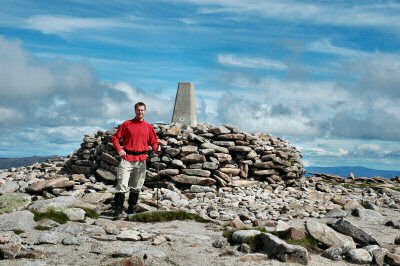 First I went up the second Munro of this holiday, Slioch (980m/ 3,215ft). While it initially looked as if the clouds might lift completely they didn't in the end, nevertheless I went to the summit (with a bit of help by a map and a compass). On the Saturday I went up Beinn Eighe, walking up to Creag Dhubh and then scrambling over to Sgurr nan Fhir Duibhe (963m). 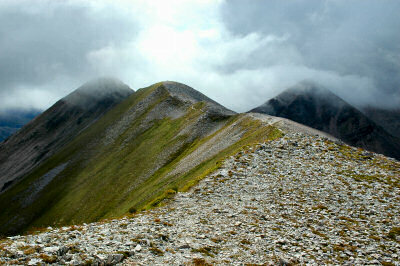 While these tops have Munro height they don't count as Munros, the 'official' Munros of the Beinn Eighe group being Ruadh-stac Mòr (1,010m) and Spidean Coire nan Clach (993m). 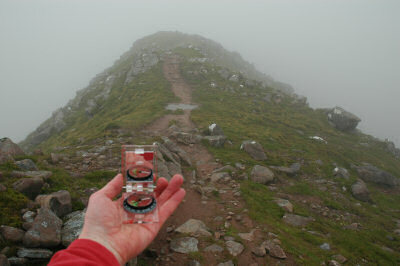 That's why I'm claiming half a Munro for this one. The Sunday was spent driving south to Argyll, from where I took the ferry to Islay. The weather on Islay was much better: Not much time for reading books, but a lot of time spent visiting a number of places, including beautiful Lossit Bay on a brilliant sunny afternoon. I also visited a few old and new friends, thank you very much for your hospitality!! The week on Islay flew past, far too quick it was time to board the ferry to the mainland again. I arrived in Arrochar on the Saturday evening for my last night in Scotland, arriving back in Swindon late Sunday afternoon. I'll start the travelogue soon, it will start appearing on my Travelogue, Isle of Islay and Charles Rennie Mackintosh site soon.